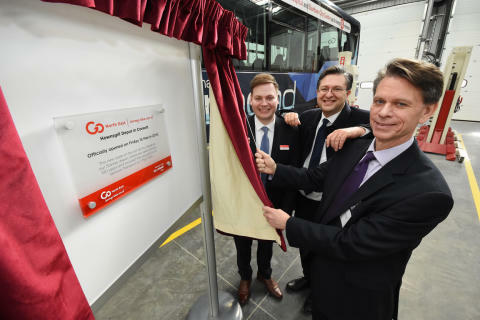 After two and a half years of development, the region’s largest bus operator, Go North East opened the doors to its brand new £3.5 million, state-of-the-art Consett depot in County Durham on Friday. The high-tech operation replaces the company’s Stanley depot, which it operated from for nearly 100 years. 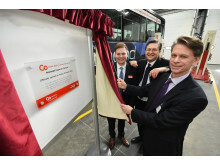 The new depot is home to 180 Go North East team members and 63 vehicles. The building was designed by Go-Ahead Group’s property team in conjunction with Gateshead-based architects, Shadbolt Group. It includes a lean engineering facility to streamline processes and make vehicle maintenance more efficient, a full-recycling vehicle wash and spill-free refuelling system. 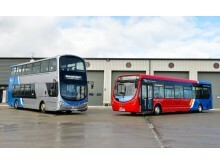 The move to Consett by Go North East is part of its extensive investment programme, which has included £10 million spent on purchasing new vehicles and upgrades to others. Upgrades included environmentally-friendly engines and comfortable and convenient facilities such as audio-visual next stop announcements, USB power sockets, Wi-Fi and leather seating.